Experience something different at The Dental Spa of New York®. Here, Dr. Sapienza will create and care for your spectacular smile while you relax in comfort and style. Unlike traditional dental practices, The Dental Spa of New York caters to your body and spirit. We offer power teeth whitening, so you can brighten your smile up to eight shades in about an hour. As a cosmetic dentist, Dr. Sapienza also offers porcelain veneers and complete smile makeovers. Our patients find a full range of general dental services in our dental spa, from crowns and composite fillings to root canals, dental implants, and aesthetic dentures. Dr. Sapienza and his team focus on patient comfort and clinical excellence. We implement gentle, non-surgical techniques and state-of-the-art dental technology for the ultimate dental experience. Enjoy our beverage bar and freshly baked bread and cookies when you arrive. In the operatory, listen to your favorite music or watch a movie on DVD glasses. Stress-reducing amenities such as comfortable blankets and pillows, warm, lemon-scented towels, and massage chairs will soothe and relax you during your time with us. 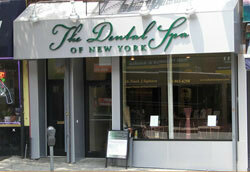 Find the comprehensive dentistry you deserve at The Dental Spa of New York. Dr. Sapienza serves patients in Brooklyn, Downtown Brooklyn, Park Slope, Cobble Hill, Carrol Gardens, Prospect Heights, Brooklyn Heights, and throughout New York City in our Park Slope dentist office. Convenient payment options and a full scope of dental services await you in our patient-centered dental spa. Call to schedule your personal consultation today. Power Teeth Whitening - At The Dental Spa of New York®, patients can choose from one-visit, in-office teeth whitening or custom take-home trays with professional teeth whitening gel. The in-office method requires just one visit and brightens teeth up to eight shades. Some patients prefer gradual teeth whitening, administered in the comforts of home. Dr. Sapienza has found both teeth whitening methods highly effective, and they can be used in succession for extended results. Porcelain Veneers - Transform the appearance of your smile in just a few visits to The Dental Spa of New York®! Dr. Sapienza places exquisite porcelain veneers that reflect light similarly to enamel, creating a natural and beautiful smile. Veneers are thin, custom-made porcelain shells attached to the face of front teeth. They mask gaps, cracks, chips, stains, slight misalignments, and other imperfections. Because porcelain veneers are handmade, they we sculpt and tint them to complement a patient’s unique appearance. Review our smile gallery during your visit, or bring a photo of your ideal smile to your consultation. You deserve the smile of your dreams, and The Dental Spa of New York® can deliver. Ultramodern dentistry. Stress-reducing amenities. Ultimate patient care. We’re not comfortable unless you are. Aromatherapy in the form of freshly baked bread and cookies, eliminating medicinal odors & reducing anxiety. Reception area with a flat screen TV and massage chairs to help you unwind and relax. Comfort blankets & pillows, warm lemon-scented towels & music headphones. A congenial, helpful staff that’ll go out of their way to make you as comfortable as can be throughout your visit with us. A cappuccino, tea, and juice bar for your refreshment. Let us pamper your body while we invigorate your smile.